In the U.S. we tend to think of protests as extraordinary events that mark a disruption in the everyday. We assume that they are performed by rabble-rousers or activist fanatics for one cause or another, or by people who don’t have more important things to do with their time, not by responsible citizens with jobs and families to raise. And more, they block traffic, get in the way of commerce, and generally force the rest of to think about things that most of us would rather just let be, even if we disagree with them. In short, protests operate in the more or less rarified context of the political, a space which presumably stands over and against the social and, in any case, confounds what purports to be the normal and natural rhythms of ordinary life. Keep politics localized in Washington D.C. or in the State House, but don’t make me late for work or get in the way of the marketplace. That’s our motto. The photograph above tells a somewhat different story. 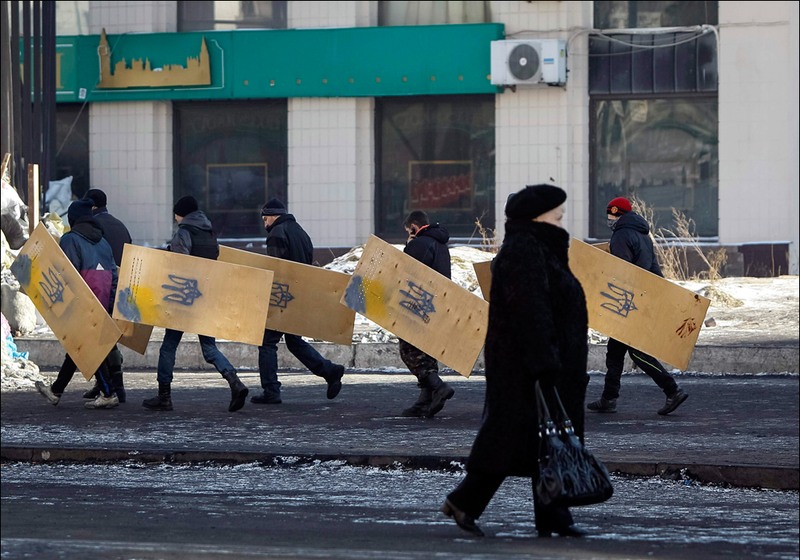 According to the caption these are anti-government protestors on their way to the barricades in Kiev to continue their challenge to the government of Ukrainian President Yanukovich. They could just as easily be on their way to a factory job. Neither hurried nor agitated, they move along the sidewalk at a normal pace, just as the woman walking in the opposite direction in the street moves at an equally steadied pace. Indeed, each seems to be guided by the normal and natural rhythms of the day. And note too that she pays them no attention, not in the manner of actively ignoring them, but in the way that we typically fail to acknowledge the others we pass in the street. They belong there with their homemade shields, as does she with her stylish bag, each going about the business of the day. The barricades they are about to populate have been maintained for sometime now, and as most of the photographs representing the remonstrations against the Yanukovich government indicate, the battles lines between the police and protestors are tightly drawn, with blood being spilt on both sides of the divide. In short, these protests are not a simple disruption in the everyday. Rather, as photographs of protests around the world—everywhere from Bangkok, Hebron, Kosovo, and Tuzla … and that is just this week—indicate, like it or not, such activities and the politics that they engage are part and parcel of the workaday world. No one—and certainly not us here at NCN—wants to see the kind of violence affiliated with such protests worldwide reenacted anywhere in the United States. But it might do for all of us to recognize that our world might be a better place if we were to acknowledge the everydayness of political protests as pointing to something more than just a rarefied political activity and not to be content with leaving the world of politics to the politicians alone. Put differently, activities like political protests are part of the work of being a citizen and they should be honored as such.